This module redirects URLs of type yourdomain.com/productreference to the product page. This allows you to post shortcut URLs to your product pages in any advertising, or to create shortcuts to group products by reference. This module is ideal for shops that include direct links to product pages in advertising such as printed catalogs, newsletters or any other kind. When dealing with many products, copying each product's link to use elsewhere is time-consuming, and, who knows if the URL will change in the future? Especially if "friendly URLs" is turned on on your shop, it is most likely that at some point you might change the product's name and the URL will change too, or perhaps the product is deleted for some reason and replaced by a new one with the same reference, causing the previous link to return an error when accessed. Some sellers also include a QR code with a direct link to a product's sheet on their website on printed catalogs. Copying each product's link to the QR code generator is very time-consuming job. This is where this module comes in really handy. What does it exactly do? It uses the product's reference in the URL to find the corresponding product page and open it automatically. Your shop has multiple languages? Don't worry! This is also taken into consideration. If you have products with references EF001A and EF001B and "show search results" is enabled in the settings of the module, then myonlineshop.com/es/EF001 will redirect to the search results for EF001. 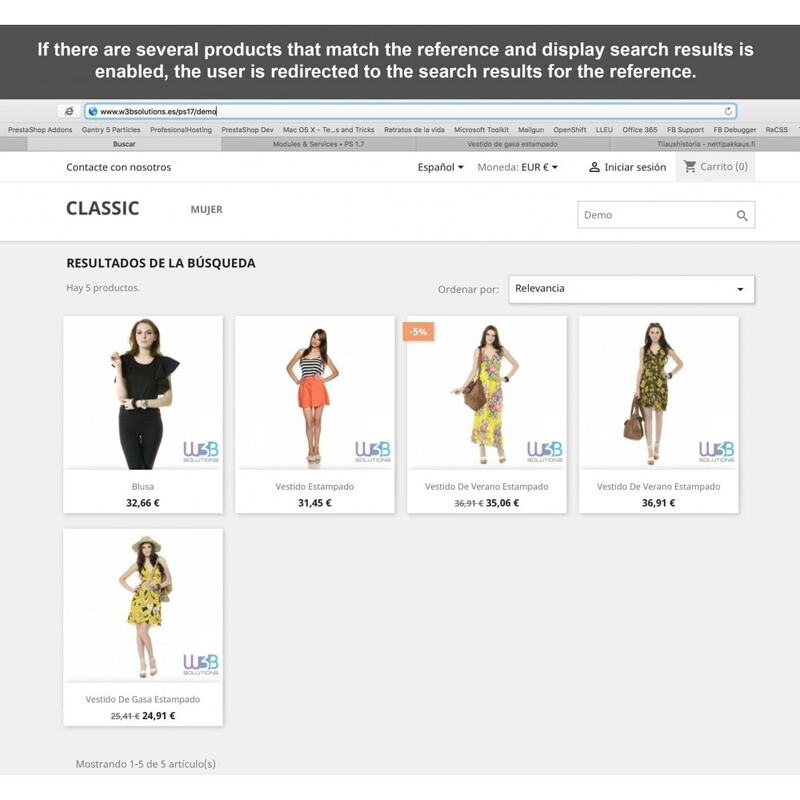 If you have many products that include for example "dress" in the reference and want to create a link to show all of them, you just need to type myonlineshop.com/dress. It is really that simple! Now you can generate a QR code for product with reference EF001A with the short version of the URL. 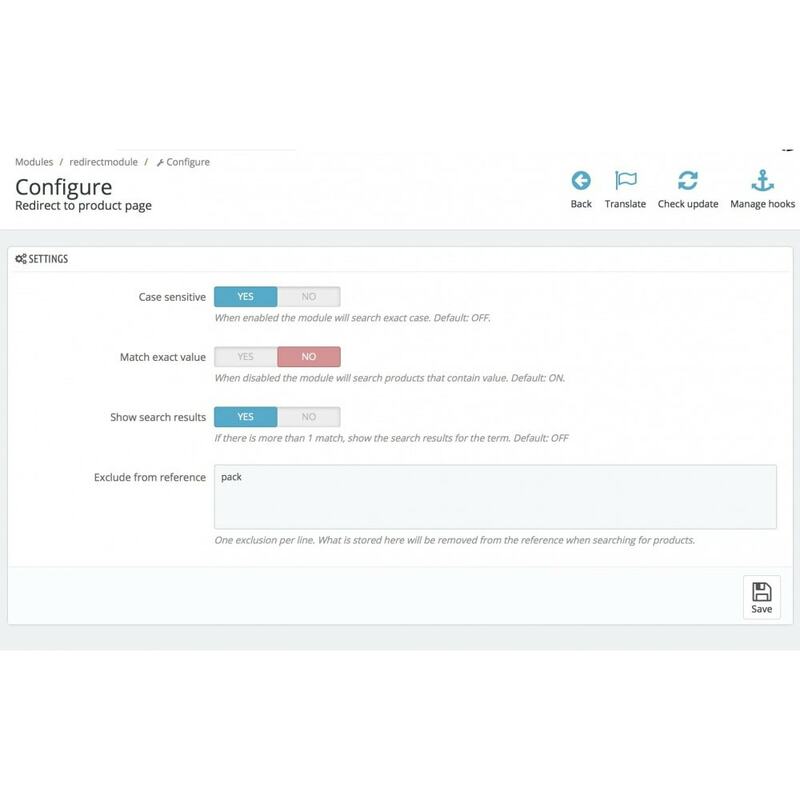 Or if you are creating a newsletter showcasing multiple products, do not worry about copying the link for each product, you can simple type the shortcut URL for each product and the module will do the rest for you when clicking on the links. This module does not affect SEO in any way, since the redirection happens on runtime. The shortcut URLs are not indexed. Define if search results should show when there is more than 1 match. Otherwise the user will be redirected to the first match. Define exclusions for the reference. For instance if [reference]pack is the same product than [reference] just type in pack in the exclusions box. Note that all exclusions apply. Fix error in debug mode when product had multiple languages.